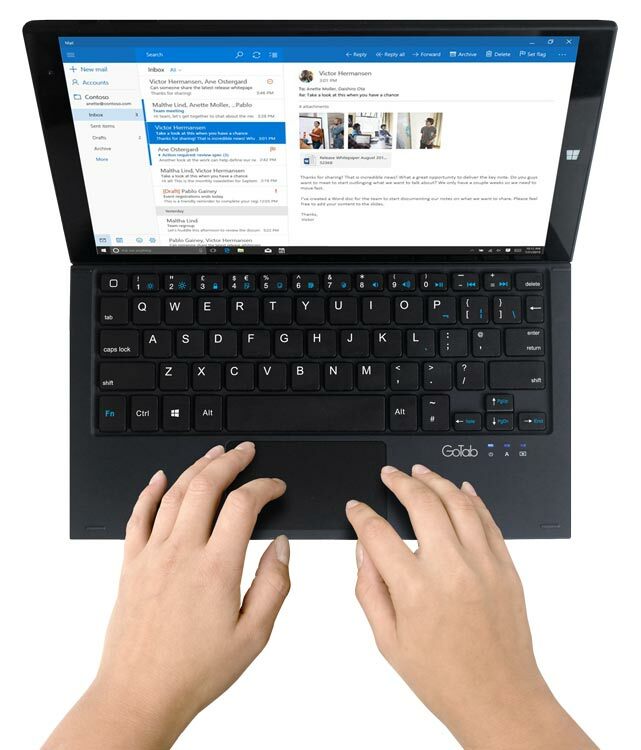 Get more done with the GoTab Docking Keyboard’s QWERTY keyboard and Trackpad Mouse. Simply dock your GoTab GW10* and be typing in an instant just like on a laptop. 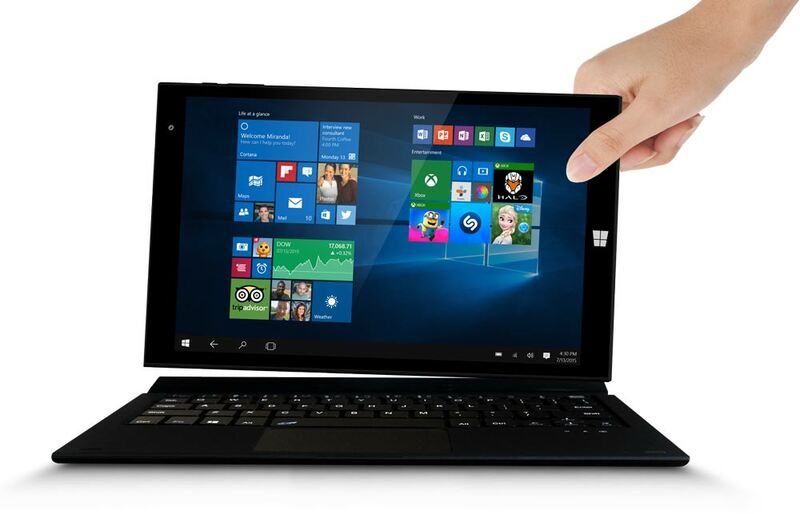 Then detach the GoTab and you get the benefits of tablet computing. The keyboard has a 3.5” mouse touchpad for convenient navigation, as well as Left & Right Mouse Buttons. 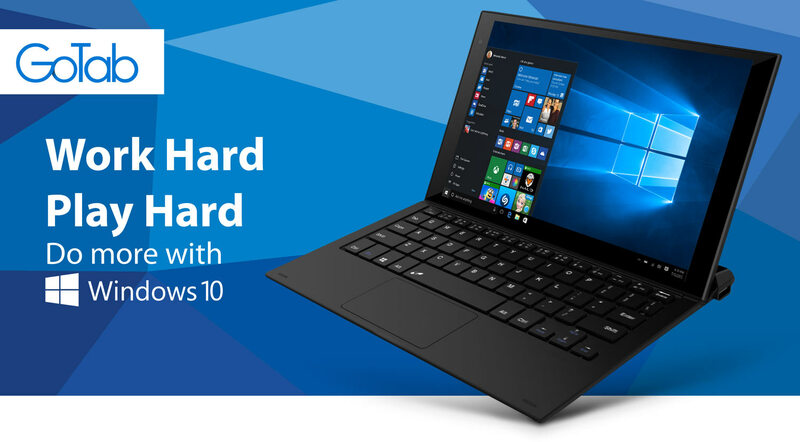 The GoTab Keyboard has the Windows™ Start™ button and a variety of Function keys to quickly do tasks, helping you work more efficiently. 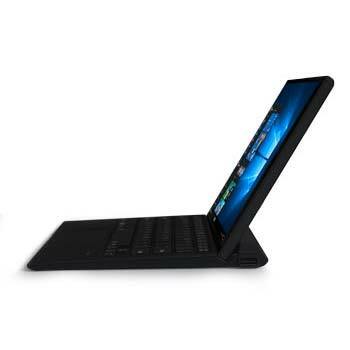 The keyboard holds the GoTab Tablet at ~60° for comfortable and ergonomic viewing. 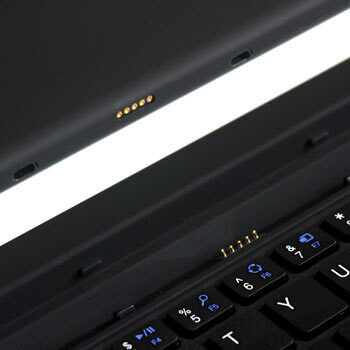 The standard QWERTY layout helps improve productivity, and the chiclet keys means typing is comfortable and smooth. 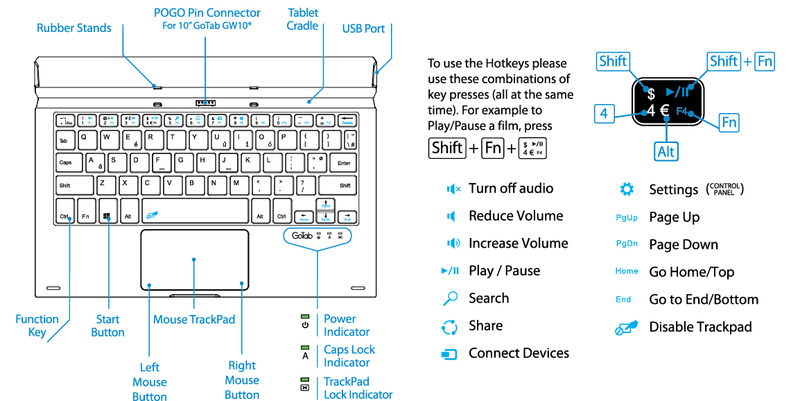 The keyboard has a full size USB port so you can conveniently use a flash drive, USB peripherals or external mouse*. 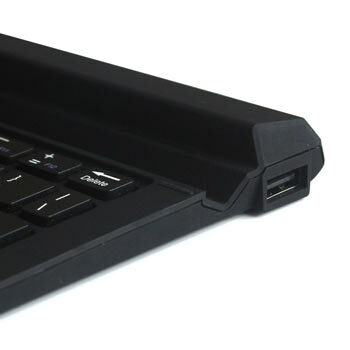 The keyboard also serves as a hard shell case to protect your GoTab’s screen when you’re on the go. • GoTab Tablet GW10 is sold separately. • No Bluetooth. This Keyboard will only work with the GoTab GW10 via the metallic POGO connectors. *Case colour may vary due to manufacturing processes. Some USB devices may be compatible. Third party devices are not supported by our Tech Support Helpdesk, and we cannot offer compatibility advice. 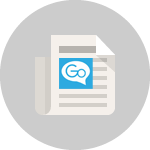 My Go Ltd is not responsible for functionality of apps and services that are dependent on third party services/updates. GoTab Tablet GW10 not included. Designed in UK. Manufactured in China. *Screens simulated, subject to change. Windows Store apps sold separately. 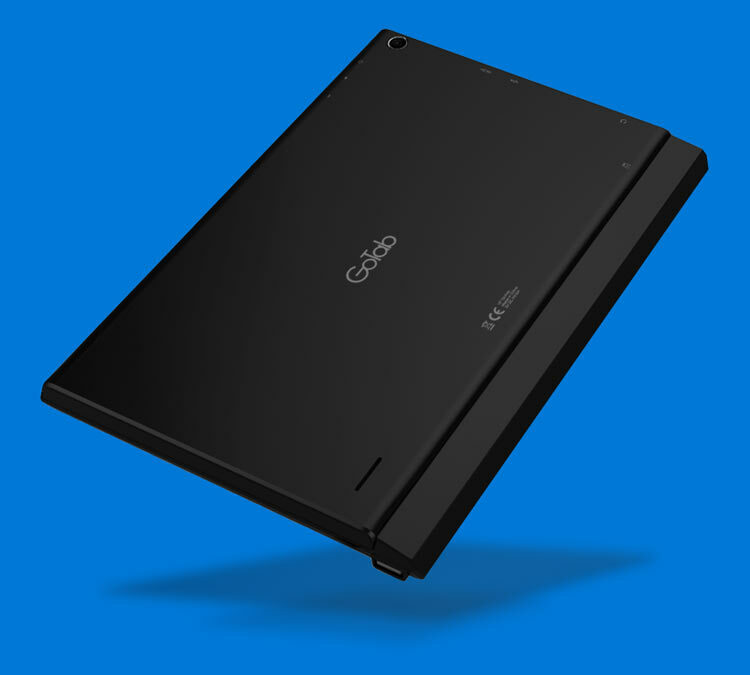 Battery Life of GoTab Tablet will reduce (dependent on usage) as the Tablet provides power to the Keyboard. Microsoft, Windows, are either registered trademarks or trademarks of Microsoft Corporation in the United States and/or other countries. 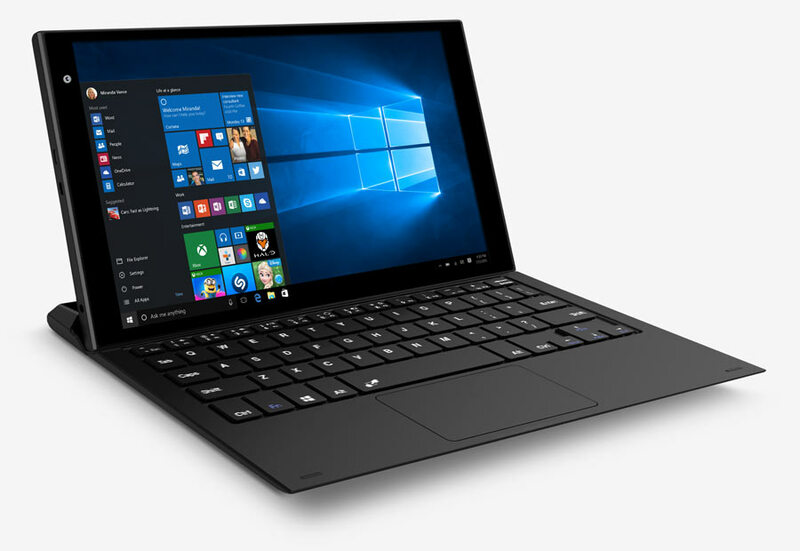 Microsoft product images reprinted with permission from Microsoft Corporation. GoTab is a trademark of My Go Ltd. All other trademarks are property of their respective owners.